Added Sugar | Christoph Gelsdorf, M.D. In the last edition of Living Well in Myanmar I wrote briefly about the dreaded ‘double burden’ of disease facing the country. While much of the population is at risk from the threat of infectious illnesses like tuberculosis and malaria, an increasing number are also contracting lifestyle diseases such as heart attack, stroke, and diabetes. The drivers of these lifestyle diseases are varied, but clearly food consumption plays a major role. Particularly worrying for residents of Myanmar is the amount of added and processed sugar consumed on a daily basis. From street side tea and juice shops and rice and jelly desserts, to the increasing proportion of packaged products in the average diet, it seems that sugar is being added to almost everything. The reason this matters is illustrated by a review article published last week in the medical journal Mayo Clinic Proceedings. The authors present a series of basic science and research studies supporting the hypothesis that sugar added to food is more dangerous than sugar which occurs naturally in food. By way of example, they cite a clinical trial in which two groups of equally matched patients were given the same amount of calories to eat, but from different sources. The first was given 5 percent of their daily calories from sugar added to food, while the second was given 20 to 30pc of daily calories from added sugar. After 6 weeks the second group had higher insulin levels, leading the authors to conclude that both total calories and the type of calories matter in the growing epidemic of diabetes. A simple explanation of why higher insulin levels are problematic is based on the understanding that the body needs sugar for energy. In order to make energy, sugar has to get inside cells. Insulin is the ‘key’ that opens the door which allows sugar to cross into cells. The pancreas manufactures insulin. So when a person eats food the pancreas is alerted and begins to secrete insulin into the bloodstream so that any consumed sugar can make it into cells. The energy that the body requires can come from sugars that occur naturally in foods, like the sweet taste in an apple or the carbohydrate content of rice. Or that energy can come from sugar added to foods, like a can of soda that has corn syrup in it or a shwe kyi cake that has been baked with lots of sugar. The key difference, according to accumulating research, is that sugar that is added artificially to foods requires the body to produce more insulin than sugar that occurs naturally. 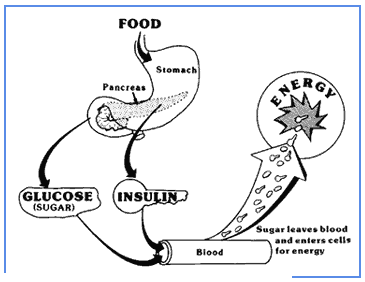 When more insulin is needed to get a sugar into a cell, the pancreas has to work harder to make that insulin. If this occurs with enough frequency and intensity, the pancreas gets overburdened and can ‘break’, resulting in diabetes. But while the problem of added sugar seems relatively straightforward, the question of what to do about it on a societal level is certainly much tougher. Dietary guidelines for Myanmar might be a first step. At the moment the World Health Organization recommends that less than 10pc of an entire day’s caloric intake come from added sugar. Although I don’t have research to back it up, I would guess that most of Myanmar’s aspiring middle class consumes far above that 10pc target. A local public health message should emphasise that there is no biological need for extra sweetness in the diet. Sugar and carbohydrates occurring in natural foods provide sufficient energy for the body’s daily metabolic needs. Finding ways to empower people to make healthy food choices for their families would mitigate the intensity of the looming double burden.